So in the end, Matsujun and Sakurai bowed out of the backflips while the rest proved they’ve still got it. I loved it when Ohno and Nino did the combo flip during opening of the Shonentai song. They look so small and cute! But in the end they look like half the life was drained out of them lol. I love these costumes they look so pretty! Arashi are set to appear in Music Station later today to promote songs from their latest album “Japonism”. They will be performing “Kokoro no Sora” and a cover of Shounentai’s “Nihon Yoitoko Makafushigi”. The Shounentai song in particular will see all Arashi members challenging backturns for the first time in 14 years. Amongst the Arashi members, Ohno, Aiba and Nino are known to have succeeded in backturns in other programs, but Sakurai Sho and Matsumoto Jun have openly declared that they are unable to do it. Fans are now worried about how this will turn out. Nino himself has said in a 2009 interview that he suffers from back pain problems, and fans are hoping he’d not pressure himself into performing it. 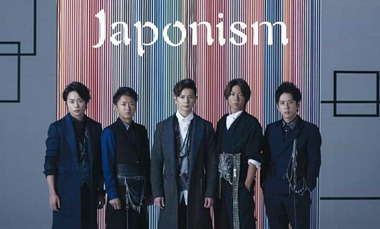 Meanwhile the MV for their new song “Kokoro no Sora” from Japonism album. The last time i saw them doing backturns was …Ohno in a UTABAN episode? Even then he was already complaining he’s too old for it. I hope they use the Juniors for this even though it’d be epic if they can still do it. “Travelling around the Yamanote Line ~Lost in love~” is a story of a guy reminiscing about a past love while travelling along the Yamanote Line(subway). It seems like TakkiTsuba have really lost their way as they struggled to recite the subway station names, a highlight during the chorus. It started with Tsubasa repeating “Osaki” after Takki, and even though Takki ignored it, Tsubasa continued to forget his lyrics. An exasperated Takki went “Ah~~!” and stopped dancing to focus on the lyrics, but Tsubasa totally gave up on the lyrics and continued dancing instead. The irony between these 2….anyways though it was surprising to see them making a mistake, their reactions were kinda cute. 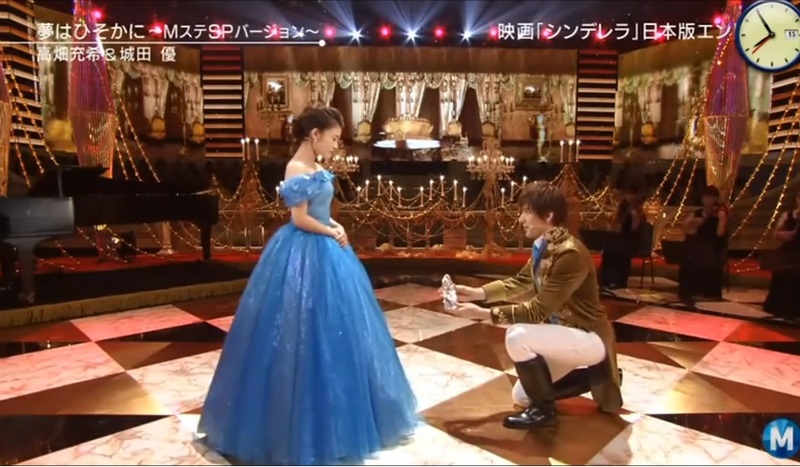 During the ending, SMAP’s Shingo teased Tsubasa so much that he shrank into himself. Probably the best song to define E-girls. These girls are really good at dancing and it shows in their powerful moves. In the middle portion where they execute the Michael Jackson moonwalk, the CENTER (whoever she is) just stole all the limelight with her aura. The guys are winking like crazy in this performance because Music Station did a special corner on the number of winks SMAP members have flashed over the past 24 years. In 1st place is Kimura, followed by Shingo. Nakai has never offered a wink in Music Station’s history. I like this song alot because the tune brings back memories from the Love So Sweet days and the lyrics i imagine would hit the heart directly. This is meant to be performed for the bride during a wedding ceremony and apparently that is what Arashi did in their music video. V6 is making alot of media appearances lately what with promotions for 24hr TV and the release of their new album. Guys are now ojisans(with the exception of Miyake Ken who defies the laws of time) but are continuing to explore new ground in music. The first song “Wait for you” is produced by Lady Gaga herself! For a second, i thought i was listening to One Direction. I do not like the electro dance pop that this group likes to release but their dances are always impressive. So they decided to up the gimmickry and include magic tricks into their performance. While i fail to understand more and more what is going on with this song, i did enjoy the magic trick performances. The Sasshi-Takamina trick at the end fails and Takamina had to do a dogeza. Cute dance and crazy visuals which in my opinion is more like Halloween. Shirota: is being shared by someone else. I’ll wait forever. Mitsuki: Even if I cry, courage should lead the way. Both: Someday we’ll meet, my Light. Believe in love. Shirota: Even when I’m alone, i’ll look up at the sky. Mitsuki: With the same eyes, I’ll look at you like my dream. Shirota: When I stumble, courage should lead the way. Mitsuki: I’m Cinderella. I have no home, no parents, no inheritance. These beautiful shoes, i don’t know if they will fit me. If they fit, will you accept me for who I am? I love you. I’ve never watched a musical in my life but if that’s going to be as magical as this then i need to watch it one day! Nice song!!! And for those who don’t know he’s Yamada Nana’s brother.. This group’s single sales is huge…like 460,000 copies for this song. I’d like to get into their music style but it just isn’t my taste.